Happy 38th birthday to My Morning Jacket’s Jim James! Jim James is truly one of the most ambitious musicians living in our age, creating and performing across multiple genres, from indie, to folk, to psychedelic and soul. 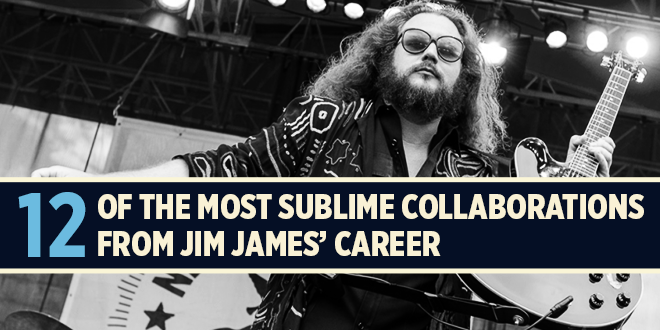 James’ musical genius has explored so many areas, and it has also brought about a huge list of incredible collaborations with other great artists. To celebrate the My Morning Jacket frontman’s upcoming birthday, join us as we revisit some of these extraordinary musical partnerships. Many people would agree that one of Bonnaroo’s most celebratory recurring acts has been My Morning Jacket. Starting in 2004, the band has played multiple mind-blowing shows at the Tennessee festival, including their 4-hour monster set in 2008, where they made rock n’ roll magic by playing beside Metallica’s Kirk Hammett. Check out full audio of the show on archive.org(http://bit.ly/23ZhzUj)and watch this glorious version of “One Big Holiday” below. In 2006, after just releasing their album Z, My Morning Jacket propelled their much deserved success by joining Pearl Jam for a number of spectacular shows on a tour through Italy. From that tour came this memorable moment in which Pearl Jam frontman Eddie Vedder took the stage with Jim James and co. for an impressive, spirited take on The Who’s “A Quick One While He’s Away.” Check it out below. Jim James can lay claim to multiple Dylan tributes by now, but the most interesting might be his collaboration with indie group Calexico for the very unique Dylan biographical film I’m Not There. In a list of other fantastic Dylan covers, James recorded with Calexico a stirring version of “Goin’ To Acapulco.” You can actually watch James sing his cover version in the film itself, or in a strong live version with Calexico at the 2008 Newport Folk Fest below. How about the time that Jim James got to tour with two different generations of personal musical inspirations? The Summer of 2013 saw him join Wilco’s Jeff Tweedy on Bob Dylan’s Americanarama tour for a number of exceptionally special shows. Check out Jim James contributing some downright beautiful vocals on “The Weight” from the tour’s stop in Hoboken, NJ on July 26, 2013. The legendary music of The Band was another huge musical influence for Jim James, as well as for My Morning Jacket. Their groundbreaking style of Americana and rock n’ roll would inspire MMJ’s sound immensely. In 2010, Jim James got the opportunity of a lifetime when he was asked to open one of Levon Helm’s legendary Midnight Rambles. James went on afterwards to perform with Levon a number of other times. Listen to James channel Rick Danko perfectly on “It Makes No Difference,” with the Levon Helm Band at the 2010 Outside Lands Festival. My Morning Jacket can also lay claim to some of the best versions of the Velvet Underground classic, “Oh Sweet Nuthin.” One such version happened at Neil Young’s annual Bridge School Benefit, a yearly concert thrown by Young and his wife to support school children with communication impairments. At the 2013 benefit, Jim James and his band lead an all-star group, including the likes of Elvis Costello and Jenny Lewis, through a special version of the Lou Reed number. Outside of My Morning Jacket, Jim James has undertaken many different, unique musical projects. One of his coolest for sure went by the name of New Multitudes, a tribute project putting new music to old Woody Guthrie lyrics with musical partners Jay Farrar, Will Johnson, and Anders Parker. Be sure to check out the full album, and let’s look back at the time The New Multitudes band backed James on his own “The Way They He Sings” at Webster Hall on March 14, 2012. The most recent piece of musical heritage Jim James has lent his prodigious personal touch on is the collaboration between himself, Taylor Goldsmith, Marcus Mumford, Rhiannon Giddens, and Elvis Costello, otherwise known as The New Basement Tapes. Now putting music to old Bob Dylan lyrics, these five, brought together by T. Bone Burnett, made an album of sheer beauty. One of their only live performances thus far took place at the Ricardo Montalban Theater, which also brought up guests Johnny Depp and Haim. Watch James rock out with passion towards the end of “Down On The Bottom” from that amazing night. Another staple in recent My Morning Jacket history has been their annual One Big Holiday festival, which takes place in Maya, Mexico and features two nights from the band in addition to sets from special guests. At the 2014 One Big Holiday Festival, MMJ invited the one and only Bob Weir up for a few songs including “Dear Prudence,” “Knockin’ On Heaven’s Door,” and the Grateful Dead’s “I Know You Rider.” Weir and James trade beautiful vocals on Bob Dylan’s “Knockin’ On Heaven’s Door” below.